The market may be overlooking Cleveland-Cliffs. Even when we're not writing about stocks, we're probably discussing some investment theme or stock that piques our interest. Here's a sneak peek at some of the conversations that go on behind the scenes with some of our writers here at The Motley Fool. Sometimes, it's hard to see the other side of the argument when it comes to investing. At times like this, it's helpful to bounce ideas off a friend or fellow investor to challenge your thesis. 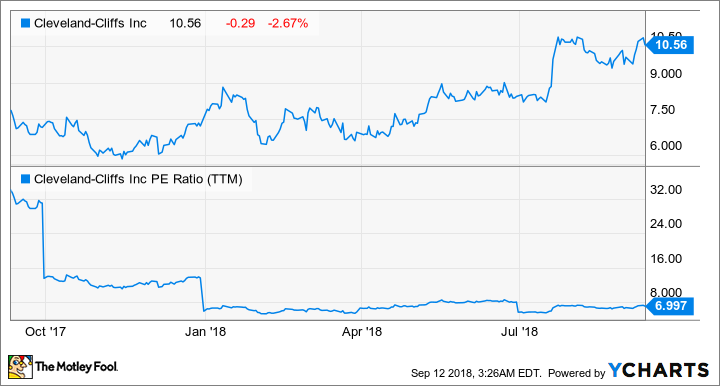 Recently, I (Tyler here) have had a hard time seeing the bearish argument against U.S.-based iron ore manufacturer Cleveland-Cliffs (NYSE:CLF). I wanted to know what I was missing with this cheap stock. So I asked two colleagues to give my thesis a reality check. Here's a summary of why I'm bullish on the stock and their retorts. It has a dominant market share with high-grade product: Cleveland-Cliffs owns 54.9% of the U.S. iron ore pellet market, and one of its competitors (ArcelorMittal) is also its largest customer. A large portion of the iron ore it produces consists of what are called DR-grade pellets, which are the highest-quality pellet available and carry a high premium to lower-quality ores. Geographic advantages give pricing power: Iron ore is a heavy bulk commodity, which means that transportation costs are high. As a result, Cleveland gets to lock its customers into long-term takeaway contracts that account for the base price of ore and the premium they would pay for higher transport costs. In the second quarter, Cleveland-Cliffs EBITDA margin was 45% even though the spot price of iron ore is down 50% from a decade ago. By shedding its other assets and cleaning up the balance sheet, Cleveland-Cliffs is generating sizable profits from its core business. Now, it intends to take on another high-cost steel input that is traditionally imported, hot briquetted iron. If management's projections are to be believed, this will be an even higher-margin business that will significantly move the needle and management intends to reinstate dividends and buybacks. Despite the fact that this business is nowhere near the business it once was, shares are currently trading at 6.9 times earnings. That seems incredibly cheap for a high-margin business that has a growth catalyst and the ability to throw off cash to investors. What am I missing here? Have you considered the impact of Trump's tariffs? Matt DiLallo: You make a compelling case for Cleveland-Cliffs. As you mentioned, Goncalves has engineered an impressive turnaround that has the company on track to grow earnings and cash flow in the years ahead. That positions the iron ore giant to not only invest in the future but begin returning money to shareholders, which is particularly intriguing since it could potentially buy back what appears to be dirt-cheap stock in a move that could create big-time value for investors. However, one thing you might be missing is the possible negative ramification of the Trump administration's decision to impose a 25% tariff on imported steel. The driving force behind the move is to level the playing field for the U.S. steel industry, which is something Goncalves wholeheartedly supports. While that move makes sense on paper, tariffs don't always work as well as hoped, which certainly seems to be the case with the Trump administration's steel tariffs. For starters, they're having a negative impact on a range of steel-consuming industries in the country, which could do more harm than good since they might negatively impact steel demand here. Furthermore, as you pointed out in this article, tariffs don't tend to be the long-term solution. You said that "tariffs don't necessarily change the global oversupply issue, and that tariffs have historically been a temporary thing." Because of that, it seems that they could do more harm to Cleveland-Cliffs than good. That's why my advice would be to carefully consider the impact the tariffs could have on Cleveland-Cliffs in the long term before buying its stock just because it's cheap. Just a good company in a tough industry? Jason Hall: I'll start by saying that I think Tyler is absolutely right about many things with Cliffs. Management has done a solid job of improving the balance sheet and shifting the company's direction up market into more profitable products that steelmakers are willing to pay a premium for. And to some extent, that should lead to better cash flows and earnings over time. But there's the bigger issue: Iron mining and feedstock production is still a tough, capital-intensive commodity business, and the vast majority of Cliffs' revenue will come from cheap iron, with market prices being the key factor behind its selling price. In other words, Cliffs has very little ability to command a premium price and is subject to the whims of the market, including foreign competition. Cliffs does look like a very well-run company with solid leadership pulling the capital allocation strings. To merely survive in this commodity business, however, that's a prerequisite, not something that makes it a worthy investment. I expect that, going forward, Cliffs will do well for an iron producer, but I'm far from convinced that "well for an iron producer" equates to a market-beating investment, even when you can buy shares for seven times earnings. My prediction: Just as in the past, iron prices will remain the biggest factor behind Cliffs' future prospects, no matter what management does. How much have you considered that in your thesis for Cliffs?